Schoen’s style is practical, informed, and helpful. 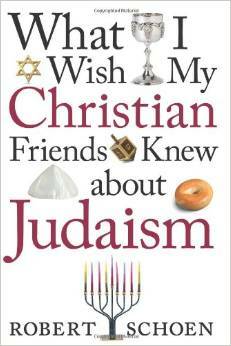 A must read for anyone who wants to understand a Jewish friend. Written in a breezy, conversational style and laced with humor, this primer on Judaism delivers precisely what the title indicates. Schoen describes himself as “a layman” and an “average Jewish American.” He is actually an accomplished musician whose compositions have been played in recital and appear on two CDs. Schoen claims that he wrote the book to present a systematic response to questions about Judaism that were posed by his Christian friends. Schoen begins his guidebook with a clear explanation of the streams of Judaism: Orthodox, Conservative, Reform and Reconstructionist. He then discusses what goes on inside the synagogue, followed by an examination of the Jewish holidays. The final sections deal with Jewish life cycle events, home life and beliefs and Judaism in the world. The book concludes with a plea for inter-faith cooperation. What is truly remarkable about this compendium is its thoroughness and lucidity. Schoen manages to touch briefly on practically all aspects of Judaism—from Israel, the Holocaust and anti-Semitism to the role of women, Jewish symbols, Jewish art and appropriate behavior at a bar or bat mitzvah, Jewish weddings, and Jewish funerals. Although Schoen says he wrote the book as a manual for Christians, Jews can also benefit from this masterful overview of their religion, either as a refresher or as a quick source of new information. With wit and wisdom, Schoen takes the beginner through the basics … Highly recommended. Schoen contributes to further understanding between America’s Jewish and Christian communities. A delight to read, this book is much more than another reference work on contemporary Judaism … Highest praise to Schoen. Entertaining, humorous and didactic, Schoen has given the gift of his extensive knowledge of Judaism. Enlightening and entertaining, this basic introduction to Judaism is meaningful to Christians and to Jews who want to learn more about our heritage. This compendium of facts, lore, and opinion is intended to help Christians become more knowledgeable about the issues of what it means to be a Jew, what the basic tenets and philosophy of Judaism are, and what problems American Jews face in today’s society. Rounding out this very informative book is a helpful glossary and pronunciation guide of Hebrew and Yiddish words. [Schoen] does a good job of explaining in simple terms key religious texts, dietary laws, and social, historical, and political issues. Schoen’s book is aimed at the general reading public and is thus recommended for public libraries.